Read what others are saying about our services and about other laser services in our area. Read what others are saying about our services. 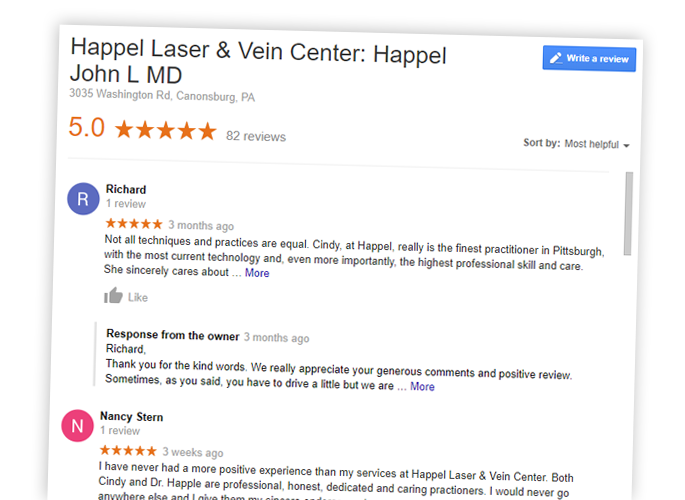 The following letters are a small sample of actual reviews from real patients which can be accessed on the internet by searching … Happel Laser Center reviews. Our waiting room also has an album containing similar accounts from satisfied customers that we would like to share with you when you come for your initial consultation. A friend highly recommended Happel Laser Center. I, too have found my experience to be nothing but positive. I never have to wait for my appointment, and Cindy is very warm, personable, friendly and knowledgeable. I even received a handwritten thank you note in the mail after my first treatment. They’re getting a new, top-of-the-line laser soon that will result in even faster, less painful treatments. I’m so excited about the results and feel liberated. I’ve been going to Happel for two years for laser treatment and have no complaints. Cindy is the best. She makes me feel very comfortable, but in a very professional way. The staff is also very pleasant and professional. The laser really works. This is one of the best decisions that I have ever made. I am Italian and needless to say have had a constant battle with dark hair in all the wrong places. This summer has been a delight. No more unsightly razor burn or five o’clock shadow. I would highly recommend going through these treatments. I never feel embarrassed or uncomfortable any longer. Here is what people are writing about our competitors on the internet. It’s all about truth in advertising. Ignoring on-line reviews can cost you money. You want to hear real life experiences from real people who have had laser hair removal done in Pittsburgh. The number of reviews is important. What are the recurring common complaints in these laser hair removal competitor reviews? For laser hair removal, do not go to a spa, a medi spa, or any place with the word spa in their name. Seventy per cent of states in this country say that laser hair removal is a medical procedure. Operating a laser is not like having a pedicure or a facial or having your nails done. Click on the links at the bottom of the page to read competitor reviews to discover the truth. In the wrong hands, there are many risks and complications to having laser hair removal. 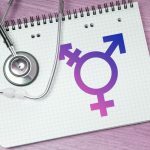 Outside of a physician’s office without any direct physician supervision, serious complications like scars, burns, or hypo or hyper pigmentation and can result. Ask yourself, how much experience does that person who is using that laser actually have? If you get a different laser technician each time, you will get different amounts of experience or inexperience using the laser. At many national chains, laser hair removal operators learned after only a couple of weeks. That quick crash laser course is usually given by their own laser hair removal chain, so be careful. 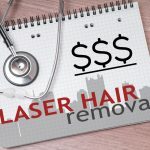 You have to be aware that safety as well as cost and convenience should be at the top of your list of priorities when you choose a laser hair removal facility. Choosing an experienced and established doctor’s office for your laser hair removal needs is always your safest choice. 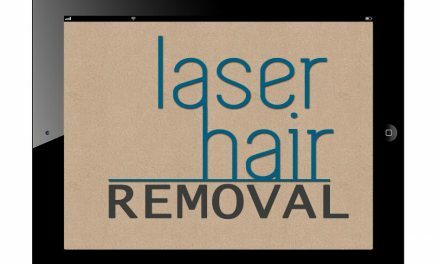 Read our laser hair removals before you make your final decision. Do your research and be careful of the final place where you finally choose to have your laser hair removal treatments done. Do your homework before you trust thousands of dollars and sign a contract at a chain from which you can never get a refund. We do not make you sign a contract or push you to buy more treatments than you need. At our medical facility, you pay as you go. That will save you money. Before you sign anything, do a search on the internet. Find all about that company. Learn from others about how they charge. Compared to a doctor’s office, discover how expensive they are. Find out how they handle their unhappy clients. Be prepared for a hard sell at the chains. Remember that you will pay a lot extra for all of those radio commercials that you hear all of the time.